On the nineteenth of this month, we commemorate the Holy Martyrs and Couple Chrysanthos and Daria. These Saints lived during the reign of Emperor Numerian (283-284). Chrysanthos was the son of a ruling senator in Alexandria, whose name was Polemonos, while Daria was from Athens. 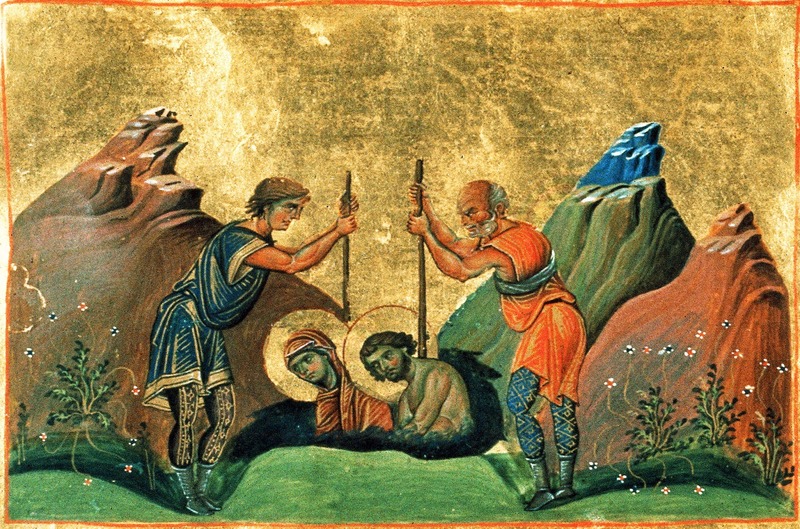 Because Chrysanthos was catechized in the faith of Christ by a certain Bishop who was hidden in a cave, and baptized by him, for this reason he preached Christ. When the father of the Saint learned of this, he had him imprisoned, and punished him by starving him for many days. 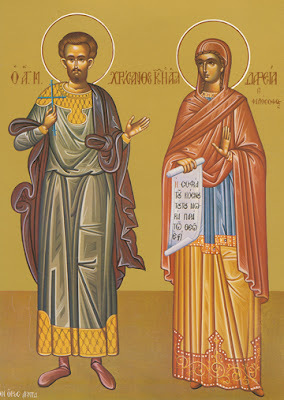 Because the Saint remained unshaken in his faith in Christ, his father brought a beautiful maiden from Athens, whose name was Daria, and who was a philosopher, and compelled his son Chrysanthos to take her as his wife, in order that by falling passionately in love, he would change from his faith in Christ. When the Saint saw her, he treated her like a sister and not a wife. They therefore both agreed to remain virgins until death. Hence instead of Daria persuading Chrysanthos, Chrysanthos persuaded Daria with his teachings. Wherefore she renounced her ancestral impiety, believed in Christ and received Holy Baptism. The two therefore taught the people to possess prudence and purity. When the Greeks learned that the Saints persuaded wives to leave their husbands and become wedded to Christ, they became enraged and accused the Saints to the eparch Kallerinos. The eparch delivered them to tribune Claudius. Claudius had the Saints removed from the city, where they were punished with various torments. Seeing that the Saints remained unharmed from the torments, he believed in Christ with his wife and children. Because they believed, Kallerinos had them tortured and put to death. Saints Chrysanthos and Daria he ordered to be cast into a filthy pit, into which they fell and were trampled, and in this way the blessed ones received the crown of martyrdom. Let us honour the like-minded pair of Martyrs, Chrysanthos scion of purity, and supremely modest Daria. United in holiness of faith, they shone forth as communicants of God the Word. They fought lawfully for Him and now save those who sing: Glory to Him Who has strengthened you; glory to Him Who has crowned you; glory to Him Who through you works healings for all. O Chrysanthos, in the sweet fragrance of holiness, thou didst draw Daria to saving knowledge. Together in contest you routed the serpent, the author of all evil, and were worthily taken up to the heavenly realms.